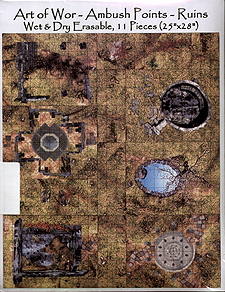 3SG's first in a series of Ambush Point Tiles is Ruins. These tiles are great as an enemy strong hold, secret meeting place or just an overnight shelter along the way to the next town. Let your players search for hidden treasure, rendezvous with NPC's, camp in what the "think" is a defensible position, drink from the magical pool, or dodge, run and shoot as they assault the enemies lair. All this and the ability to add your personal touches with a wet or dry erase marker. Wow your players and make them suffer at the same time.